A last-ditch effort or just an oversight, one Dota 2 team forgot about the sixth man in every match: the creeps. 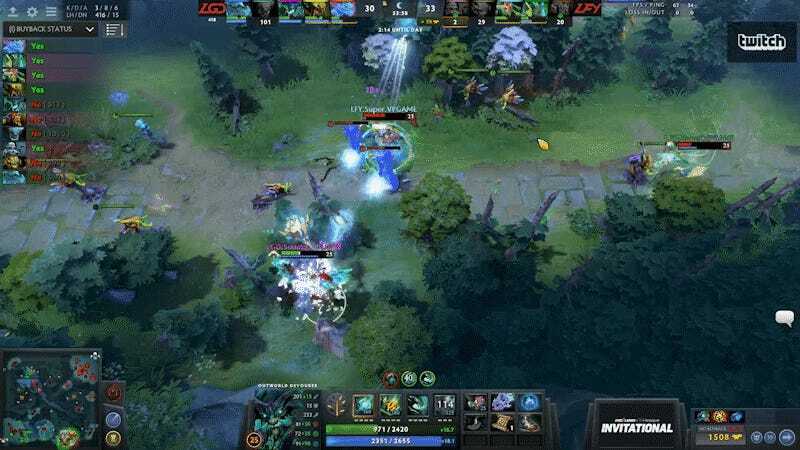 The post-International lull is over, Dota 2 is back in business, and the ongoing StarLadder i-League Invitational 3 qualifiers are an opportunity for teams to get their first competitive matches under their belts. In a sister-squad match between Chinese teams LGD Gaming and LGD.ForeverYoung, a series of kills sent the aggressive FY squad into a retreat, with LGD proper in hot pursuit. What LGD didn’t seem to consider was that their ancient was still wide open, and computer-controlled soldiers were pouring onto it. The ancient is the win condition of Dota 2, much like a king in chess. A game of Dota 2 ends when one team’s ancient, sometimes called “throne,” falls. FY had destroyed the barracks in both the top and middle lanes, which buffs the AI-controlled soldiers sent down those lanes every 30 seconds. So while LGD was devoting all their resources to killing a very strong Medusa and Necrophos, durable troops were pouring, buff pawns that were beating the Radiant ancient to pieces. FY took the game, and would go on to close out the set 2-1, advancing to the Chinese region’s grand finals. Qualifier matches are still playing out today, as Dota squads new and old vie to earn a spot in the Invitational, where they can start tallying up points for the 2018 competitive circuit. You can watch the matches here.